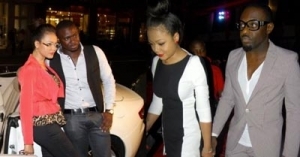 The rumour in town about the love affair between Ghanaian screen goddess, Nadia Buari and Nigeria’s Jim Iyke may finally come to a halt as Nadia, the model and actress revealed her new lover named Bomb Bacious Clay. Nadia, who received two nominations for Best Actress in a Leading Role at the African Movie Academy Awards in 2007 and 2009, recently steps out with her singer and songwriter popularly known as, B. Clay, at the Eredi Pisano and New York Giants celebration of fashion off-the-field in USA. Sources said the issue of Nadia and Jim is just a publicity stunt as the ‘real owner’ of the property has come to claim his good back. Readers will remember the Jim and Nadia being seen together at the last Vodafone Ghana Music Awards in Accra not long ago. B Clay who was born in Ghana but has Nigeria blood flowing in his system is in the US as you read this.